A better map of the 2016 election results... Friend, former colleague, and not-yet-escaped Californian Simon M. sent this along. It's an interactive “prism map” of the county-by-county election results (a snapshot of this is at right). The color of each county shows a summary of how the county voted, from dark blue for massively pro-Clinton to dark red for massively pro-Trump. That much is familiar, as it's been used on many web sites. 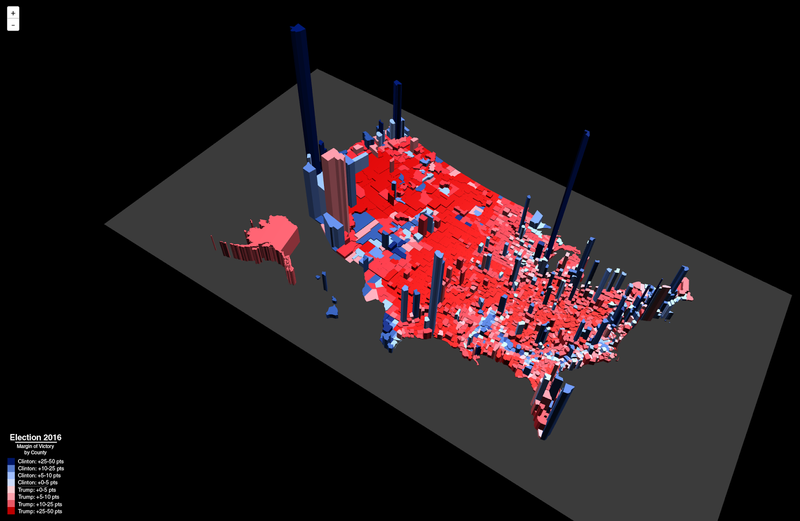 The height of each county shows something else, though: the relative number of votes in each county. Here you can see why even though most of the area of the country is red (pro-Trump), the massive number of votes in the blue (pro-Clinton) counties has even more votes. Most of this map actually looks like a bunch of blue towers on a red lawn. Utah has its own small blue tower, in the counties encompassing Salt Lake City. All of the other blue towers are also counties containing cities. On the entire map there are just a few reddish towers. As I mentioned, the map is interactive. Play with it for a few minutes and you'll gain some insight about the geographical dimension of our country's polarized politics. For example, take a long look at Texas. I spent some time looking at the population desert that is the part of the American West that I love, and that I live smack in the middle of – that bodes poorly for our future, I'm afraid, with massive populations all around us. There's a blog post about the map as well.